With the term tennis elbow (a type of elbow tendonitis) you could expect, that this injury is only caused by playing tennis, but this is actually only the case for 5% of the affected people. Approximately half of the tennis players will eventually be faced with a tennis elbow. Usually a tennis arm occurs on the side (or arm) with which you write. The development of the complaints is mainly caused by repetitive movements. This could be, for example, activities like painting, assembly line work, mouse use and the tightening of screws. This creates an overload and inflammation in the area of the tendon attachment to the elbow bone. 2% of the population experiences a tennis elbow, with an average age between 40 and 50 years. The complaints can also arise from the neck or shoulder region, which a therapist can examine and treat. Pain symptoms at the outer bony protrusion of the elbow. Painful, tiring, stiff feeling in the arm, especially in the morning. Radiation of the pain can occur to the upper arm, shoulder, forearm, wrist and sometimes even to the fingers. The pain complaints occur when the stretching muscles of the wrist and hand are tightened. Pain complaints if the hand is stretched while someone else gives counter pressure. Pain occurs when a chair with a stretched elbow is picked up at the backrest of the chair. Pain when bending the wrist backwards. The pain can be provoked by an active rotation against resistance. How to tape a tennis elbow? 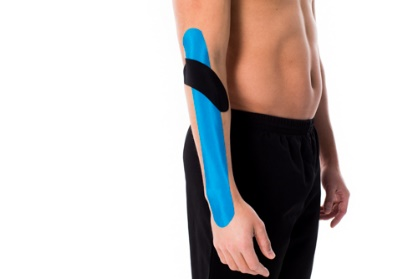 In addition to a therapeutic treatment such as massage and exercise therapy, CureTape kinesiology tape can be used to reduce the pain and to promote a faster recovery. Tip: Because the kinesiology tape is placed near the wrist, it could come off easier due to sweat or movements of the hand. By using CureTape Sports (as in the accompanying example), the tape application often remains on longer. In order to relieve the extensors / flexors, a blue I-tape is used in this example (extensor carpi radialis longus, extensor carpi radialis brevis and m. Brachioradialis). Measure the I-tape in stretched position. Lay the base distal to the ^wrist in a slightly stretched position (hand in neutral position). Extend the elbow and bring the hand into palmar flexion. Then apply the detonizing tape with slight along the forearm, direction proximal to the elbow over the extensors and rub it firmly; apply the last 5 cm of the tape without stretching. The starting point of the tape is called the punctum fixum and the end point is the punctum mobile. Black tape for activating the m. Supinator. The m. Supinator takes care of turning the hand outwards. Apply the base of the I tape with slightly inward twisted position of the elbow (in slight flexion). The starting point of the tape (punctum fixum) is on the lateral epicondyle on the origin of the m. Supinator and not on the olecranon (back of the elbow), this can irritate. Apply the kinesiology tape to the proximal part of the radius. The fascial structures “derotate” in this way. Check the operation of the tape after the application, for example by provoking an active exorotation against resistance. If the pain is reduced, the tape has has been applied well and has started it´s positive influence on the recovery of the tennis elbow. Please note that applications provided on our website are not clinically proven. All mentioned applications are based on extensive evaluation and case studies with licensed physiotherapists and/or other health professionals. Attention: Mentioning source is mandatory, when using the content on this page.